Makes 24 cookies. Per 1 Cookie: 80 calories; 2 g sat fat (10% DV); 65 mg sodium (3% DV); 7 g total sugars. Made with 100% real chocolate. Estd. 1939. New look! Same great taste. Ingredients you can trust. No artificial flavors or colors. No preservatives. Cocoa Plan. Responsibly Sourced: Cocoa through the Nestle Cocoa plan. Nestlecocoaplan.com. Thoughtful Portion. 1 portion = 1 cookie. 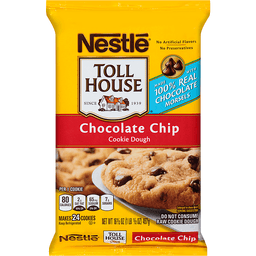 Enjoy a Nestle Toll House cookie with a cup of nonfat milk for a delicious snack. Let's Connect: VeryBestBaking.com Text or Call Us 1-800-289-7314. SmartLabel: Scan for more info.